Looking for any items in this duck egg/ pale blue speckled glaze. I decided that this is the type of ware that would go best in our busy household and our dishwasher and the glaze just appeals to me. 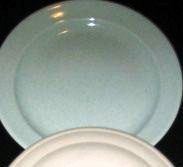 So if anyone has any of this glaze in any shape escpecially Dinner plates because so far I haven't found any, I'd love to buy any. Forgive my ignorance Ev what shape is the Luncheon Coupe? Thanks Ev but I'll pass on those for now, they'll probably be gone now anyway. In the last couple of days I've managed to get 55 or so side plates lol so I need to work on dinner plates, ovals, cups and jugs. Thanks Jeremy, this is the trader that so kindly helped me with 42 plates. This is the same as my little jug. The number within the listing is wrong. Mine says 715-01 as per title, Vitrified (not colour-glaze). Not an item seen much but surely very expensive. 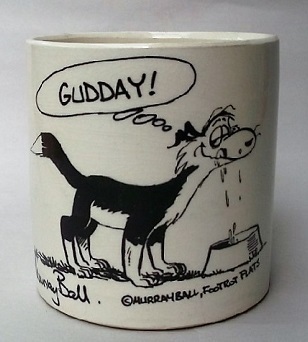 Yes I noticed those auctions, the jug is way too expensive for me but I have it on my watchlist nonetheless. The other auction I am the bidder on them so I am hoping to win those. The spouts are different on the jugs which spout does your have? I am still working on something to tempt a trade with you!!!!!! I confirmed today at the Portage Museum that this duck egg blue vitrified glaze is called Speckle. Can't find a number for this, but hopefully will come across it at some stage. I have Speckled Glaze 460 and Speckle Mugs 461 and there are so many speckled glazes that we can't be sure which one is the duck egg blue one. I'm sure it will turn up sometime though.